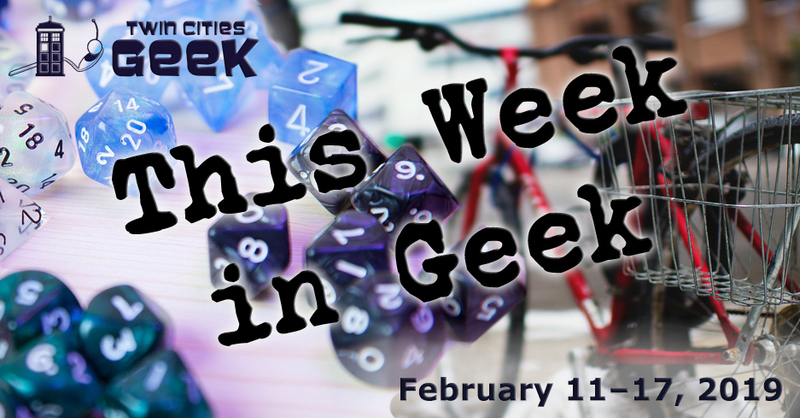 Welcome to This Week in Geek, your guide to events of interest to the Minnesota geek community for the week of Monday, February 11th to Sunday, February 17th. When: Monday, February 11th at 6:30 p.m. When: Tuesday, February 12th at 5:00 p.m. When: Tuesday, February 12th at 5:30 p.m.
Come on down to Blackstack—a local brewery renowned for its inventive takes on ales—for an opportunity to play and create. Blackstack will be hosting this event in collaboration with the Science Museum of Minnesota (beer nerds may recall Thunder Lizard—their excellent collaboration from last summer). Science Museum members will get $1 off every pint, so network and test out if you’re better at tinkering after a pint and a half of hazy IPA. Kiddos are welcome, but participants must be 21 or older to imbibe. When: Tuesday, February 12th at 6:00 p.m. This event is put on by the Professional Editors Network, and is all about the nuts and bolts of the business. This all about finding the work, and meeting your goals in this often challenging business. Per the event, please RSVP to [email protected] This is a great opportunity to meet other editors, and hear some success stories for possible inspiration. When: Tuesday, February 12th at 6:30 p.m. When: Tuesday, February 12th at 7:30 p.m.
Come to the February edition of Fearless Lab and become a test subject for experimental comedy. Are you ready for something that no one else has seen, or that needs some testing before going to a wider audience? This is a pay-what-you-want event with a cash bar. Expect some of the material to be R-rated. Performers include James Fairbairn, Garrick Dietze, Tom S. Tea, Pat LaVone and Pher Sturz. Come and experience YogaQuest, a blend of yoga and fan-fiction storytelling led by certified yoga instructors. Experience a yoga workout experience and a story at the same time. The theme for this week is to be determined, so be ready for anything, and check the Meetup group as the event gets closer. This event is winding down, and will be replaced by online classes in the near future. When: Wednesday, February 13th at 7:00 p.m.
TC Trek Trivia: Can You Hear Me Now? When: Thursday, February 14th at 6:00 p.m. The cold and dark vastness of the cosmos may leave one feeling lonely, but this event is all about the way that love can be star crossed. Learn mythological tales highlighting the importance of the stars to matters of the heart, and get cozy as you learn these classic yarns. See constellations associated with love in a way that only the planetarium can show. When: Thursday, February 14th at 7:00 p.m. When: Thursday, February 14th at 7:30 p.m. and Saturday, February 16th at 7:30 p.m.
See the ’70s classic before you have to go to Carousel! Logan’s Run is a classic of dystopian science fiction, full of bizarre set pieces and fun little touches that deserve to be seen. Tickets are $3, and the amazing soundtrack alone is worth the full price of admission. Do you want to test your mettle, or are you just curious enough to dip your electronic beak in the world of eSports? Then Player Up is the event for you. Tickets start at $10 for general admission, and $20 for general admission and tournament entry. Expect tournaments of some of the hottest competitive games today, including League of Legends and Fortnite. This is also a great way to connect with fellow gamers, and chill out for a weekend with an after-party and more. When: Friday, February 15th at 11:00 a.m. to Sunday, February 18th at 10:00 p.m. Roll dice, meet fun geeks, learn some games, or jump back into old favorites. Con of the North is a nonprofit gaming convention held in the Twin Cities catering to role-playing, miniatures, board games, card games, LARPing, and computer gaming. Preregistration is closed, but onsite registration is still open. All of the available gaming space has been booked for events, meaning that there will be a plethora of games to choose from. Expect strong showings from Saturday Night Space Opera, Pathfinder Society, and other more niche groups like the Tekumel track. When: Friday, February 15th at 6:00 p.m. When: Friday, February 15th at 7:00 p.m. When: Friday, February 15th and Saturday, February 16th at 7:30 p.m.
See five new plays centered around a single theme: noir. Presented by Fearless Comedy Productions, enjoy stories of criminals trying to pull off a heist while outsmarting the law and the censors, a psychic detective and a skeptic, a classic noir tale with a twist, the revelations of an Uber driver, and a positive detective. Tickets are $10 in advance, or $15 at the door, and check out our review of last year’s Fearless Five series for more info. When: Saturday, February 16th at 6:00 p.m.
Come enjoy a winter wonderland of model trains under the warm glow of lowered lights. This event showcases beautiful old model passenger trains in a variety of wintry scenes, with miniature Christmas lights and more. Tickets are $15 for individuals, with kids under the age of four getting in free; there are group rates available as well. When: Saturday, February 16th at 8:00 p.m. Represent your favorite fandoms and your favorite music at this annual cosplay and karaoke extravaganza held at Grumpy’s Bar & Grill in Roseville. This is a 21-and-up event, and promises an evening of geeky fun with partying, singing, costumes, and fun. Costumes are not required but highly recommended. When: Sunday, February 17th at 10:15 and 11:15 a.m. When: Sunday, February 17th at 12:00 p.m. When: Sunday, February 17th at 5:00 p.m.
Once again, I wish I lived there.